On Jul. 29, 2017 the 50th anniversary of the tragedy aboard the aircraft carrier USS Forrestal (CVA-59) was commemorated at Joint Base Myer-Henderson Hall with a special ceremony. As reported in the article USS Forrestal Tragedy Remembered 50 Years Later written by Chatney Auger, more than 250 surviving crew members and their families filled the seats of Conmy Hall to remember the Sailors who died in the fire on USS Forrestal. Sailors stationed at nearby commands including the Center for Service Support Detachment Defense Information School, Strike Fighter Squadron (VFA) 106, Strike Fighter Squadron (VFA) 11, Expeditionary Combat Camera (COMCAM), and Naval District Washington presented American flags during the ceremony to represent each Sailor who passed away. On Jul. 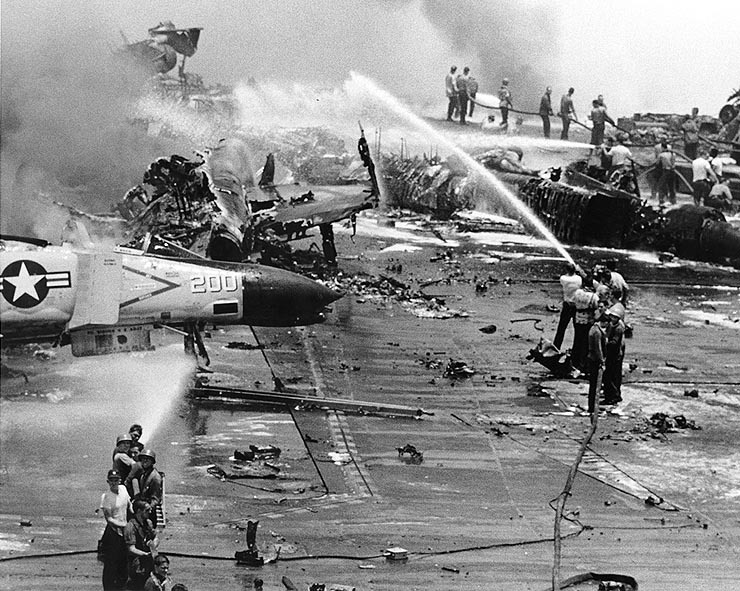 29, 1967, a rocket was accidentally fired aboard USS Forrestal, causing massive damage to the ship and a fire that killed 134 Sailors and injured many more. 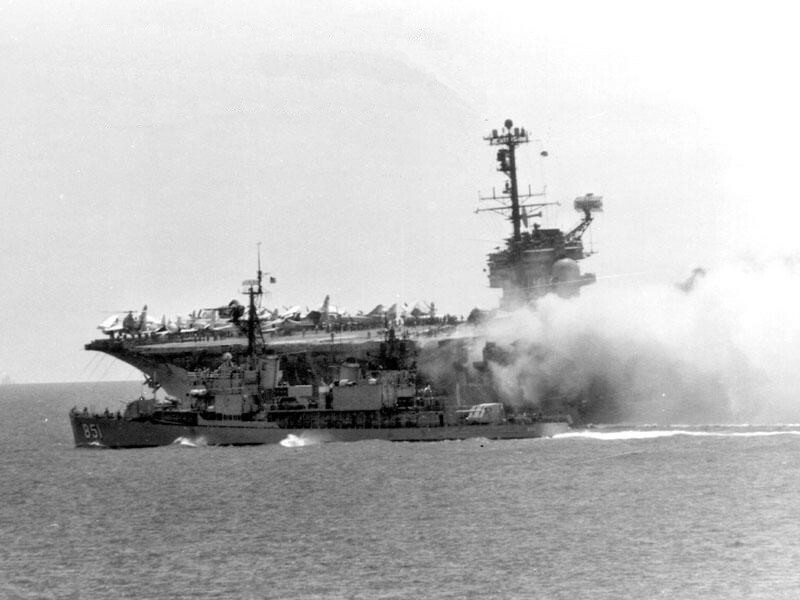 It took more than 24 hours for Forrestal Sailors as well as Sailors from nearby ships to completely extinguish the fire. The USS Forrestal Association is a non-profit veterans’ organization formed in 1990 that is committed to preserving the memory of those lost in the tragedy. The group puts together events every year to help honor and remember their fallen shipmates. O’Hare says three years ago, on Jul. 29, a young woman came up to members of the USS Forrestal Association as they were laying a wreath to honor fallen Sailors. She had never met her father and told them he was killed in the fire on the Forrestal. She asked the group if any of them recognized her father’s name. “Three of the guys there knew her dad and she spent the next three hours crying, listening to stories about him. That’s what it’s all about. It’s about getting other people to understand what we went through and the comradery that we shared on that ship,” said O’Hare. 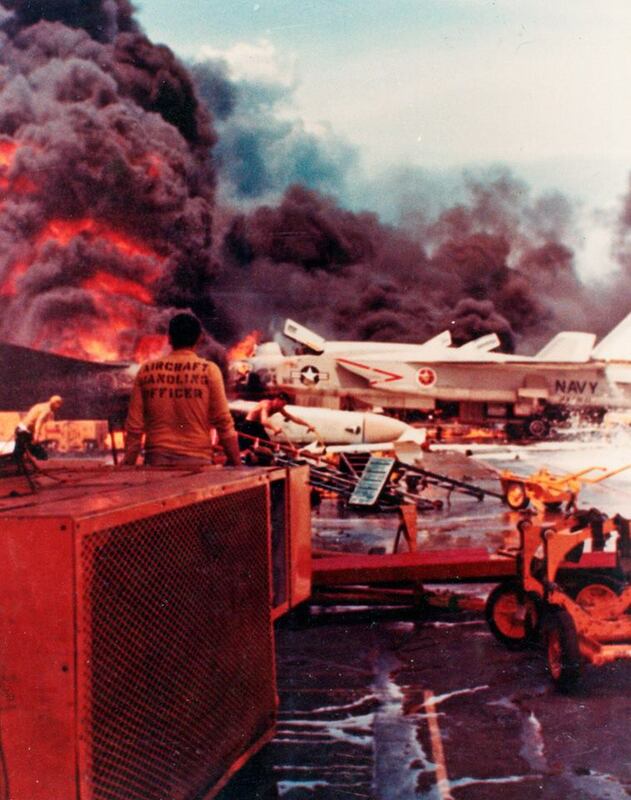 The following video, which actually is a U.S. Navy motivational film for the service personnel on the prevention of fire and for learning firefighting damage control measures, tells the story of the tragic fire on board USS Forrestal.